Officials with the Fairness Campaign say Kentucky remains one of 28 states that have not updated their laws to protect LGBTQ Kentuckians. 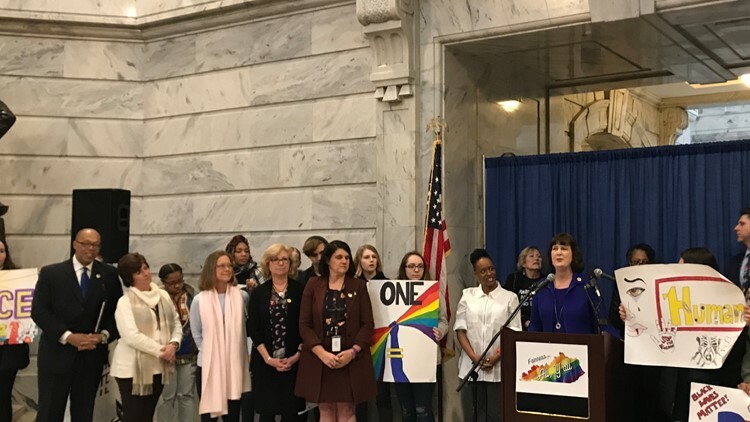 LOUISVILLE, Ky. (WHAS11) – The LGBTQ community and supporters held a rally in Frankfort Tuesday in support of a statewide fairness law and conversion therapy ban. Both bills (HB164 and SB166), introduced to the General Assembly, would update the state’s Civil Rights Act to add sexual orientation and gender identity among those protected cases in employment, housing and public accommodations discrimination. Only ten cities have local Fairness Ordinances that include Louisville, Lexington, Covington, Vicco, Frankfort, Morehead, Danville, Midway, Paducah and Maysville.